The latest edition of Progress is out! Each May we celebrate the anniversary of the magazine. This is the 115th year the magazine has been in operation. If you would like a digital copy emailed to you sign up below. Become a member to receive a physical copy. Here is the editorial. Recent Prosper news includes budget submissions to the Federal, Victorian and Northern Territory Governments. We have had meetings with the Grattan Institute and also the Dept of Environment, Land and Water. A certain highlight was hosting 20 tax officials from the Chinese province of Jiangsu. They came to discuss the intricacies of land policy in light of China’s proposed streamlining of property charges from six to one annual charge. The most pertinent question from the delegation? “Is land tax altered to make the land price go up or down?” If only, we laughed in reply. This edition features a step inside the growing movement to address monopoly power. Recent Big Tech issues at Facebook regarding the Cambridge Analytica scandal raise concerns of economic might alongside surveillance rights. MP Andrew Leigh and Adam Triggs’ work on Australian market concentration is alarming. Concentration levels are at least three times greater than the US in a number of industries. This sets the scene for the UNCTAD report on The Revenge of the Rentiers. They run through defensive corporate strategies inherent in patent thickets, patent fencing, PPPs, corporate welfare, share buybacks,tax loopholes and revolving doors between business and government. Please study those figures on economic concentration and Return on Assets. Polly Cleveland’s The Democrats Confront Monopoly gives insight to the political and economic machinations undermining advocacy work in the area and the resultant concerns in public office. The typical Georgist monopoly argument centers on the wealth concentrated in land. Transferring taxes off the productive sector and onto land rents has a multi-faceted effect. Lower land prices enable greater access to prime locations for small business. Big box stores face a comparative disadvantage to smaller, more nimble entities. Further, a simplified tax system encourages entrepreneurial risk takers to start business. Remember that mergers and acquisitions typically peak at the top of the land cycle, with corporate raiders purchasing not on a company’s operating prowess, but on the value of their land holdings. Mason Gaffney’s Quantum Leap Effect discusses the impact of land speculation in curtailing the efforts of labour intensive industry. Whilst the article discusses these impacts in the opposite direction to how LVT would affect the site, I place this seed here for you to visualise how a Georgist system helps restore prime locations to their original ‘hive of activity’ nature. What could be done to tax the privatised natural monopolies? 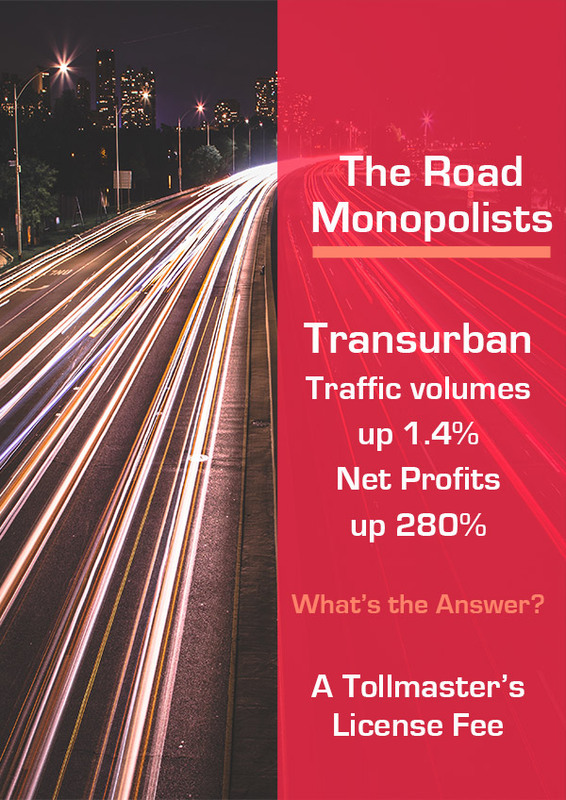 As discussed in my Total Resource Rents of Australia report (2013), natural monopolies such as Transurban would pay a yearly tollmaster’s license fee based on their Earning Before Interest, Taxes and Depreciation (EBITDA) ie before the tax-trickery. Geoists in History Patrick Edward Dove raises core issues of serfdom in “The land is for the nation, and not for the aristocracy.” The future of smart cities as data mining hubs selling our every instinct for commercial gain brings into play Dove’s concerns of a reign of justice. Godfrey Moase starts us off with a detailed analysis of the ALP’s urgent need to address rent-seeking handouts. He provides handy campaign tips on how this could frame the conservatives as the party of insiders in this state election year. Godfrey discusses key Georgist policies to rebalance the advantage big business holds over the community. Sign up now! Read the full edition.